Three years later, I’m going to consider this an archive page. My views have changed and I’m constantly learning. I myself wouldn’t do pasta sauce this way anymore. 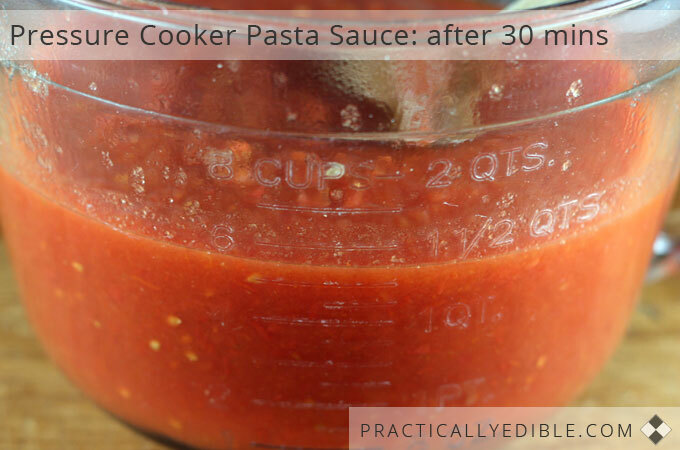 I am leaving it up as I know many people are curious about the idea of using a pressure cooker for pasta sauce. The results just took too much futzing and too much time, and, they are going to vary a lot for people depending on whether your pressure cooker vents moisture out as steam or not and how much — there are different types including electronic now. 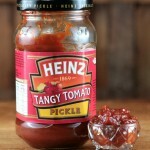 The exception would be if you are making a home-canning recipe, and it calls for the tomatoes to be reduced to a sauce in another way such as boiling in a pot. While many tested, safe home canning recipes can be notorious for not giving reasons behind why they want something done in a certain way, in general it’s that way for a good reason, and you do want to follow the directions of the people who developed that recipe. 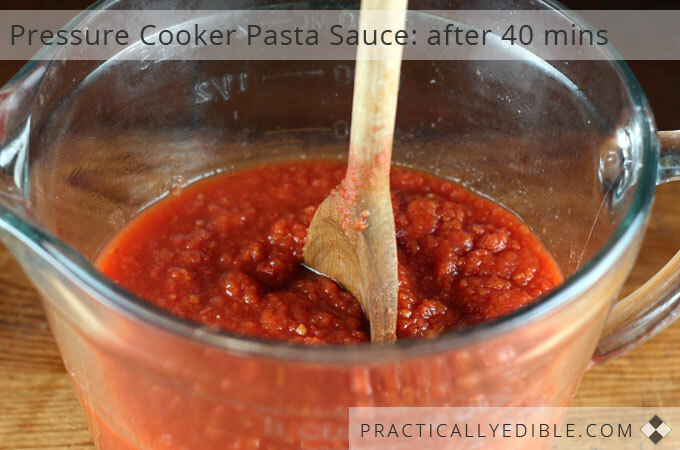 If you do want to make a pasta sauce for home canning, bear in mind that safety aspects must be paid attention to once you seal food in a jar and stick it on an unrefrigerated shelf. Do not use someone’s Italian nonna’s recipe you find on the web. Botulism spores must be controlled for, and those old recipes do not take that into account. 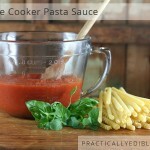 Here is a growing list of safe, tested pasta sauce recipes for home canning — some of which call for boiled down tomatoes, some of which call for tomatoes reduced through roasting, so you can take your pick. Many recipes will call for added acidity in the form of lemon juice or citric acid. Don’t skip that step, it’s there to ensure a safe pH. So again, I’m leaving this up just for those who are curious if anyone ever documented attempts to use a pressure cooker to reduce a tomato sauce. If you’ve tried and had success, let me know, saying what model of pressure cooker you used. I’d be particularly interested in hearing from people who used an Instant Pot or similar type of electronic pressure cooker. 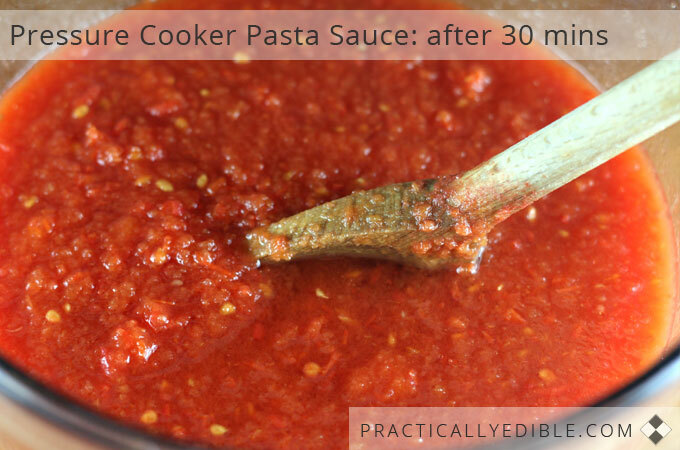 I’d recommend you read this pressure cooker pasta sauce article by Laura Pazzaglia over at Hip Pressure Cooking. My piece was originally written in 2014, two years before Laura wrote hers. I wish I’d had her advice back in 2014! 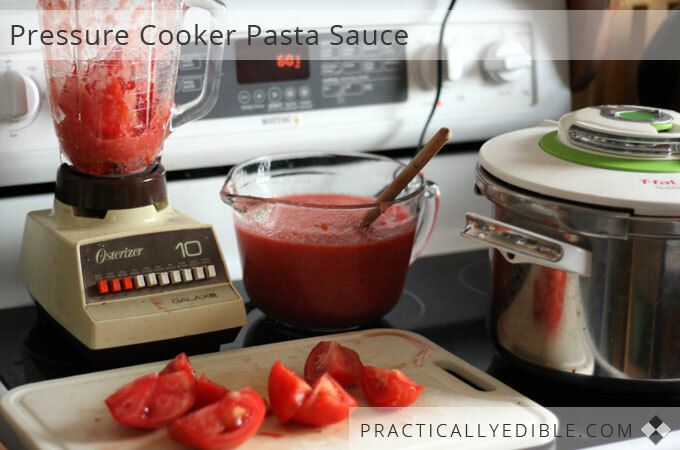 This turns fresh tomato purée into a very thick tomato sauce with no tomato paste needed, nor any stirring needed once the cooking has begun. Wash the tomatoes, quarter them (no need to peel or seed, but do so if that is your preference), process through food processor. You will end up with a thick purée / juice. At the end, let pressure release naturally. 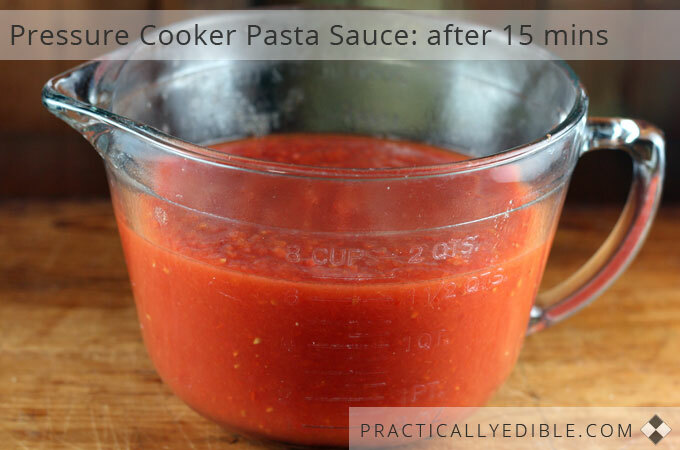 If it is still runnier than you wanted, bring back up to pressure and cook some more — all things being equal, say, 15 to 20 minute intervals. Yield: exactly one half the volume you started with. 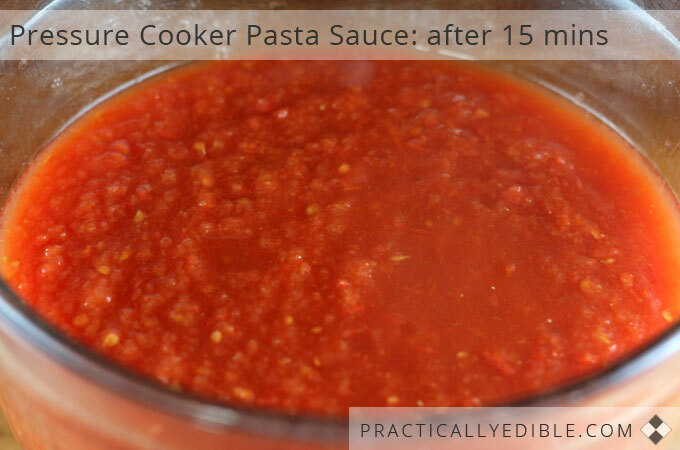 I’m going to give you my experiment step by step so that you will understand how the cooking time affects the thickness of tomato sauce in a pressure cooker. I’m also going to provide photos so that you can see how the sauce shapes up after different periods of time. My pressure cooker is a Nutricook™. I used the veg setting on it; that is a low pressure setting of around 40 kPa (5.8 Psi). I used to not be one for skinning and seeding tomatoes. I pooh poohed the idea, as many people do nowadays. 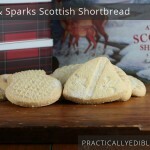 But now that I’ve learnt proper techniques, it’s really not a bother, and it does result in a more palatable product. I’ve also come to desire having those tomato skins for dehydrating. Once they are dried, they can be whizzed into a powder, that can then be used as a garnish on dishes, or as the base for a great meat rub, etc. If you are making a pasta sauce recipe for home canning, and your directions tell you to peel, then you must peel. The people who developed that recipe will be counting on that reduced microbial load going into the canner. See here for tips on peeling tomatoes. I began by puréeing the tomatoes in a blender, but it’s a pain: they get stuck and you have to remove the jug, jiggle it so they will fall down more and hit the blade, etc. 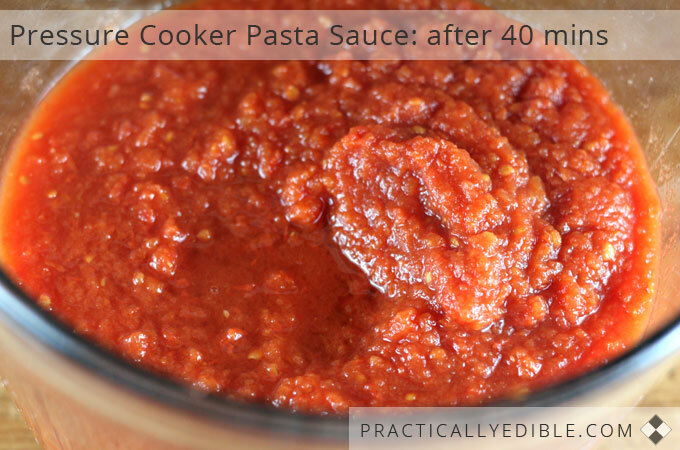 When I switched to a food processor for the tomatoes, the work went much faster and it did just as good a job. Above, you see my initial starting setup. When I switched from the blender to a food processor, the processing of the tomatoes into a tomato purée went much faster. I did my initial test with 8 cups (2 US quarts / 64 oz / 1.9 litres) of tomato purée. I should have done this looking at the metric side; the comparisons later on would have been so much easier. Anyway, I didn’t, so the rest of the world and future generations will hate me. But then again, with measuring jugs this big, it’s not as though we’re talking graduated cylinder precision anyway, eh? There above is what the puréed sauce looked like, fresh out of the food processor, and ready to start cooking with. I poured the sauce in the pressure cooker pot with nothing else: no oil, no herbs, no bay leaf, no salt and pepper, no tomato paste, nada. This is a basic sauce test. With the lid off, I brought the raw tomato sauce to a good rolling boil, stirring frequently with a non-reactive, wooden spoon (habit from times past when dealing with tomatoes) as the boiling started. I was very leery of this initial coming to temperature stage: I did not want the sugars in the tomato to scorch at the bottom of the pot under the heat high necessary at first in pressure cooking (another good reason to keep tomato paste out at this stage, by the way.) When the boiling got so vigorous that it was frothing and I couldn’t stir it down anymore, I put the lid on and sealed it. I set the time for the first cooking for 15 minutes, on the veg setting on the Nutricook (lowest pressure.) I figured that wouldn’t be enough, but I wanted to be able to assess the progress in stages. After 15 minutes, the starting volume of 8 cups / 64 oz / 1.9 litres has reduced to: 6 3/4 cups / 54 oz / 1.6 litres. That’s a reduction of 15 % from the initial raw purée (1.9 litres to 1.6 litres = 300 ml). There it is above. It’s something that I’d term “fully cooked tomato juice.” It’s ready to be bottled or frozen as processed tomato juice, to be used in a soup, or as a juice, or simmered down further in an open pot into a thick sauce with the addition of tomato paste, flavourings, onion, peppers, mushrooms, etc. But our goal is to see if we can avoid the whole simmering cauldron scenario to make it a thick sauce. 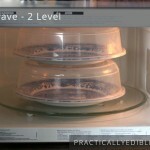 The added bonus is that reduced volume requires less space in the already over-crowded deep freezer. So onward. After a total of 30 minutes, the volume has reduced to: 5 1/2 cups / 44 oz / 1.3 litres. That’s a reduction of 30 % from the initial raw purée (1.9 litres to 1.3 litres = 600 ml). There it is above. 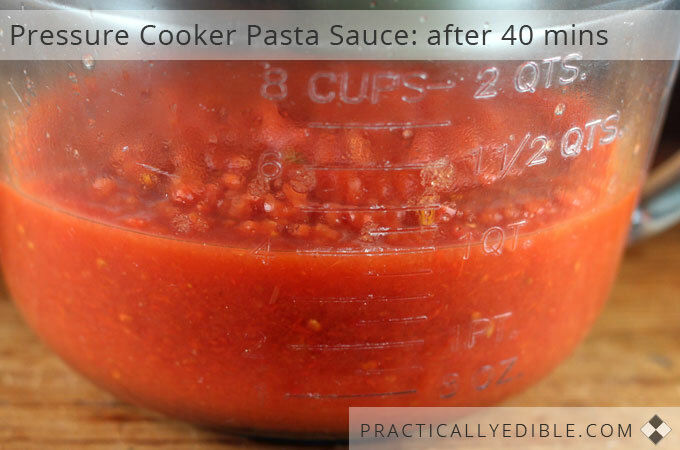 It is thick enough to pass for most homemade pasta sauce uses, quite nice. However, I’d like to see if a small amount more of cooking will thicken it even further. If it takes hours more of pressure cooking to thicken it significantly more, forget it. But if a few minutes more can make a difference, I’d like to know. So I’m going to give it another 10 minutes. After a total of 40 minutes, the volume has reduced to: 4 cups / 32 oz / 950 ml. That’s a reduction of 50 % from the initial raw purée (1.9 litres to .95 litres = 950 ml). There it is above. It is thick enough for swirls in it to hold. It’s quite thick and heavy; you’d almost think there were tomato paste in it. In fact, it’s so thick that…..
You literally can stand a spoon up in it! If you’re looking for something as thick as a sauce that came out of a commercial jar, 40 minutes is the timing you are after for this volume of raw tomato purée. 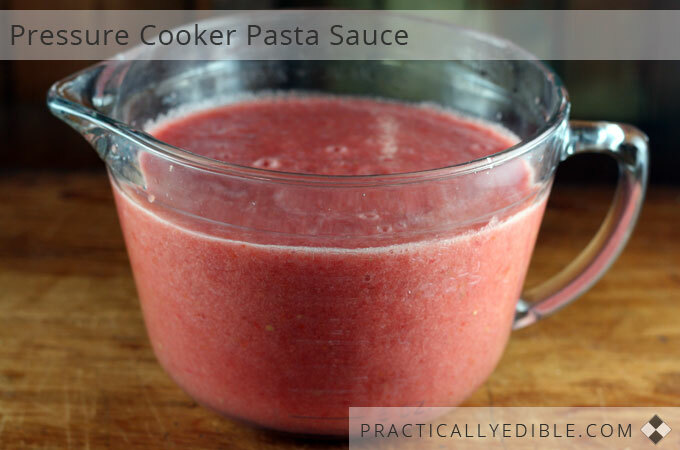 You won’t be disappointed, and there is no need for tomato paste. 40 minutes in a Nutricook pressure cooker, anyway. Times may vary a bit either way in your pressure cooker. Also, please note: I would speculate that the time required might have been longer if fresh veg that give off water had been added. Veg such as bell pepper, onion, zucchini, mushroom, eggplant, etc, because as they cooked and broke down, they would have released more water into the pot that needed to be cooked away. Summary: 40 minutes on low pressure will turn 8 cups (2 US quarts / 64 oz / 1.9 litres) of fresh tomato purée into a very thick tomato sauce with no tomato paste needed. The yield was 4 cups / 32 oz / 950 ml. I had 12 dozen tomatoes to process. When puréed, that yielded I think it was about 6 or 7 of those large measuring jugs. Anyway, if I processed one jug at a time through the pressure cooker, I was gonna be there all night. Literally. Plus, in a real-life tomato sauce making situation, you have bazillions of tomatoes to process at once. When it rains tomatoes, it pours. It cascades. You don’t cook 2 or 3 cups of the stuff at a time. So, I tripled the volume being cooked at one time. I wanted to go more than double, but I wanted to stay well under the safe fill line on the pressure cooker; as well, I didn’t want to scorch the bottom while I waited for a totally huge amount of liquid to come to temperature (always the worry in a pressure cooker.) So, I triple it was. A leap for sure, but not a totally crazy one. No photos, as the evening was getting very late, and the magic was leaving the room on this topic, but here are the results. I started with 24 cups / 192 oz / 5.7 litres of fresh tomato purée. Again, good rolling boil, stirring frequently, before the lid went on. Veg setting / low pressure. After 15 minutes: 21 cups / 168 oz / 5 litres. Tomato juice. After 40 minutes: 17 1/2 cups / 140 oz / 4.1 litres. 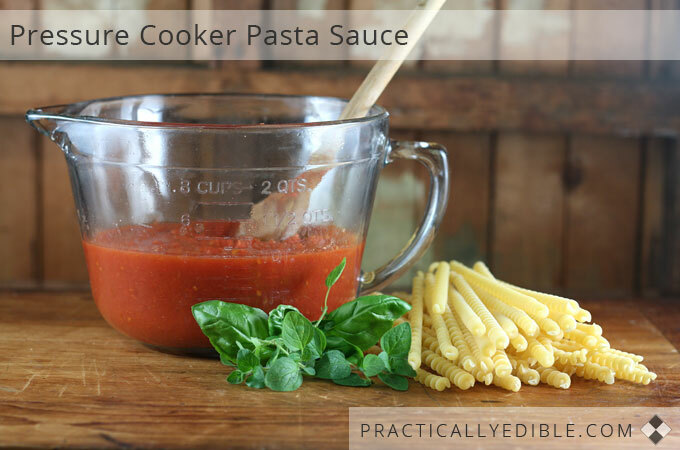 Maybe just a tad thinner than what you’d describe as a “quick homemade sauce”. 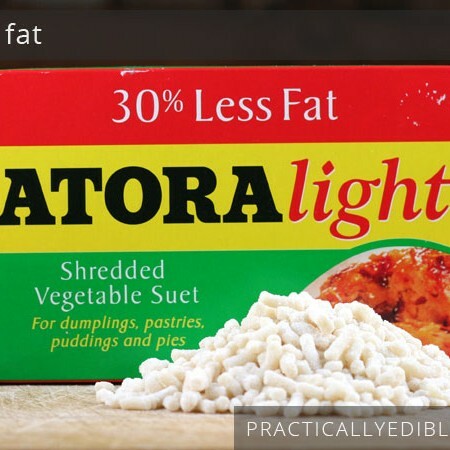 Usable, but most people would want thicker. After 60 minutes: 15 cups / 112 oz / 3.3 litres. A thickish homemade style sauce, but the spoon won’t stand up yet. After 85 minutes: 13 cups / 104 oz / 3 litres. A very thick sauce that the spoon will stand up in. We’re done here. Summary: for a larger volume at once, a longer cooking time is needed. 24 cups / 192 oz / 5.7 litres of fresh tomato purée required 85 minutes of cooking time on low pressure. The yield was 13 cups / 104 oz / 3 litres. Caution: If you are using a Nutricook, and you are doing a long session like this with a lot of liquid being expelled as steam, I would remove your Nutricook timer every 25 minutes or so to wipe away any water condensing under the timer. Just a quick wipe with a paper towel will do it and put it back in; don’t press the buttons to mess up the time. Better safe than sorry, as condensation can kill a Nutricook timer faster than you can say Jack Robinson. Note: the cooking time might actually be quicker because I did start and stop the pressure cooker three times to record the ongoing results. I haven’t tried using canned tomatoes yet, but in the dead of winter when fresh tomatoes cost a bomb I definitely would. Here’s what I would try. I would pass canned tomatoes, juice and all, through a food processor until I had 8 cups (64 oz / 1.9 litres) of tomato purée. I would bring that to a rolling boil in the pressure cooker, with no oil, tomato paste, etc, added, stirring with a wooden spoon until you can’t break the boil anymore, then put the lid on, seal it, bring to pressure, and set on low pressure for 30 minutes. Let pressure release naturally. I’m suggesting 30 minutes rather than 40 (as per the fresh tomatoes) as canned tomatoes have already had a bit of a head start by being cooked in the can during the canning process. Check after 30 minutes, and see. If needed, recover, bring back up to pressure and cook a bit more. Tip: it’s pretty easy these days to get no-salt added canned tomatoes at no additional expensive so why not get those and take one more small step to regain control of sodium levels in your kitchen? 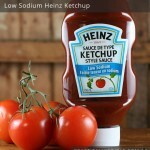 The tomato sauce, as is, is pretty boring (aside from the fantastic tomato taste), BUT the beauty is, it is flexible; you could use it just as you would a canned plain tomato sauce, which is to say as an ingredient in something, or, you can take it and run with it now. Add some herbs, some oil, some roasted veg, some sautéed minced onion, garlic, carrot and celery and simmer a bit; some cooked ground beef maybe. P.S. See Laura Pazzaglia’s advice on how to cook perfect al dente pasta in a pressure cooker, every time. It works. I do it all the time now. In fact, if you’re interested at all in pressure cooking, Laura’s book “Hip Pressure Cooking: Fast, Fresh, and Flavorful” (2014) is ground-breaking and I can’t recommend it highly enough. An eminently usable book that teaches you both recipes and principles. * Nutricook™ is a registered trademark of SEB, France. I had to chuckle at your comment about folks from the U.S. not using pressure cookers. I know! What’s with that? I was totally in love with mine in the States and now that I live in Ecuador where (a) I’m at 2500 meters and it takes much more time to cook things than it did at nearly sea level and (b) the beef we get locally is tough as shoe leather, a pressure cooker is essential. 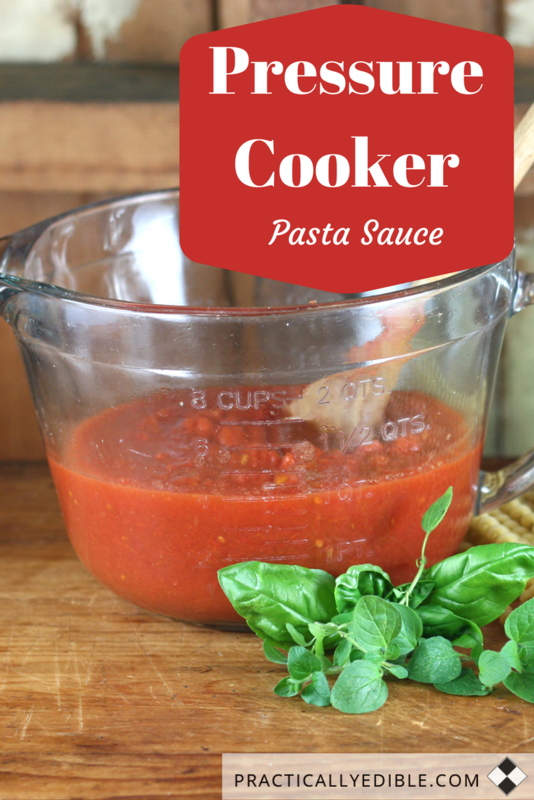 I love using it for so many things and I’ve been looking for a good recipe for tomato sauce. I don’t grow my own but I can buy them for $1 per kilo, sometimes less, so it’s not a terrible hardship. At any rate, I’m so thrilled that I looked at the second listing in Google rather than sticking with the first. 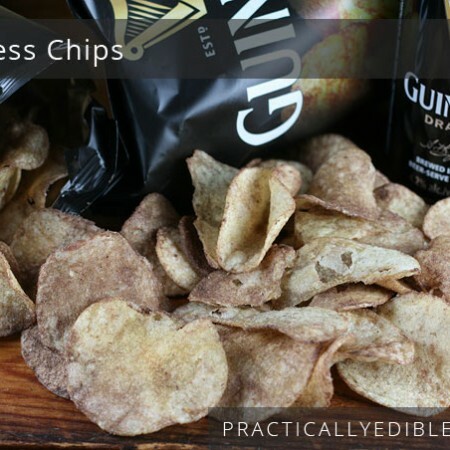 You are my kind of cook–no peeling, no seeding, just make it. I’m looking forward to reading much, much more of your blog. Thanks! Thanks for this experiment – interesting. I too cook my tomato sauce in the PC – I agree, the sauce tastes fresher, better than the conventionally cooked one (also the colour is more vibrant). I would like now to inderstand the “science ” behind this- the guys from Modernist Cousine say that even in the moist environment of a PC, the Mailard reaction happens, for instance. Why does it taste better? …or Am I getting things wrong? I often cook 3 kg tinned whole plum tomatoes@40 minutes@low pressure (using the famous Marcella Hazan’ butter and tomato sauce recipe); the resulting sauce is very good, but I then have to reduce it for about 15 minutes to get a nicely thick consistency. Stefano, the evaporation was very slow for sure, though I did get it after 85 minutes at 40 kPa (5.8 Psi). Sometimes I think that is ridiculously slow, as to not even being worth bothering… but then I just made tomato sauce last week in a regular pot where it took even longer, and at a higher temperature for the stove burner….So I was saying to myself: Darn, neither way is great, we need more choices to reduce tomatoes down to sauce in an energy-efficient matter! (Some people say dehydrate first, then make sauce.) What would you say the volume was on the 3 kg tomatoes you mention — about 3 litres? And your low pressure was probably around 40 kPa (5.8 Psi), right? …as for the conversioin kgs/volume…yes 3 kg should be roughly 3 lt…. Just wanted to comment that there are indeed MANY folks in the US who use pressure cookers. I have a stove top Kuhn Rikon but i have an electric stove and it wasn’t ideal for pressure cooking. I now have an electric Instant Pot that i use practically every day and absolutely love. I belong to 3 Facebook groups of other electric pressure cooker users and there are many of us. I make cakes, cheesecakes, and everything else. 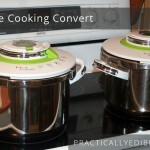 Hi Pamela, one of my favourite pressure cooker sites is by an American: http://www.hippressurecooking.com/ . Why wasn’t your electric stove ideal for pressure cooking? Was it induction? I belong to a facebook group that has over 43,000 members, I would imagine a good deal of them are in the US. I use my Instant Pot 4-5 times a week, sometimes 3-4 times in one day. Not sure why you thing Americans don’t use a PC. Hi Kathy, I still maintain that pressure cooking is not the norm in North America. While the Canadian invention of the Instapot has someone increased interest in pressure cooking in North America, it’s still by far the exception rather than the rule. I hope that changes, and I hope that my statement will rile people up to get a move on and get pressure cooking. But in the meantime, at the present time, it’s nowhere near a common kitchen appliance in North America, sadly. Reading from the US and attempting this tomato sauce recipe despite the 10 foot pole comment. 😉 I will concede that it is a new addition to my kitchen. Peeled Chestnuts: Make or buy?